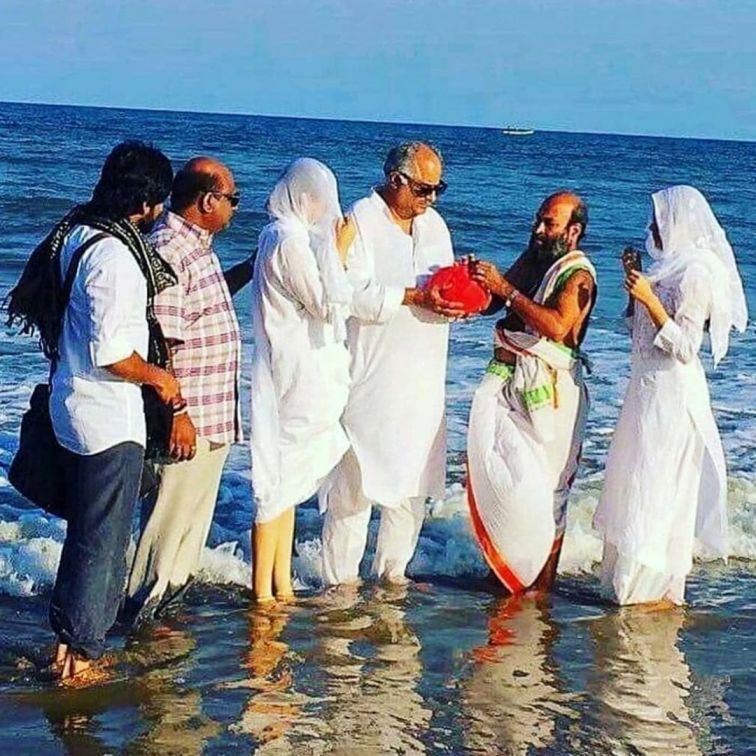 After a tearful good bye to the veteran actress Sridevi on February 28, 2018, Boney Kapoor and daughters Janhvi Kapoor and Khushi Kapoor immersed the ashes in Rameswaram. The Chandni actress breathed her past on February 24, 2018 in Dubai due to accidental drowning. On the day of the funeral, the mortal remains of the actress was wrapped in the tricolor while the actress was adorned with a beautiful Kanjeevaram sari. Sridevi was accorded with State Honours and was cremated at a crematorium in Mumbai a day after she was brought from Dubai. The ashes of Sridevi were brought by Boney, Khushi and Janhvi in a special aircraft to Rameswaram. A picture was posted on the social media which has shown an emotional Boney Kapoor with daughters Janhvi and Khushi standing by his side with the priest doing the rituals. Janhvi will be turning 20 on March 7, 2018. A few days before her birthday, the upcoming Bollywood actress shared a heartfelt message for her mother Sridevi through her Instagram account in which she appealed everyone to love their parents and to remember her mother fondly. Boney Kapoor too penned down his thoughts and feelings over the loss of his beloved wife. Sridevi and Boney Kapoor were married since June, 1996 and together they have two daughters Janhvi and Khushi.